Elisabeth von Thüringen, or Elisabeth of Hungary, is the patron saint of Hessen and Thüringen. She lived from 1207 till 1231 in the area around Marburg. The Elisabethpfad visits places from her life. 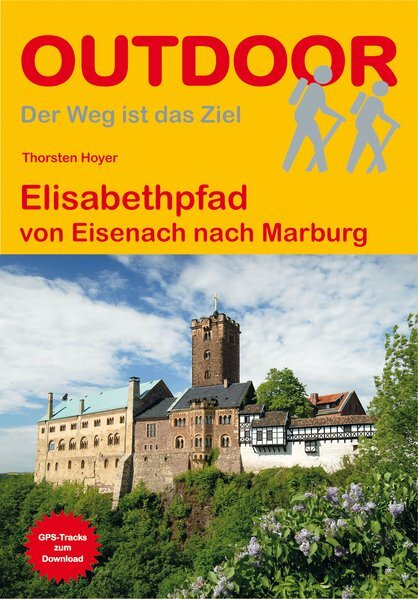 On of the trail starts at the Wartburg castle near Eisenach, where Elisabeth started a hospital for the poor. The trail passes other important sites from Elisabeth’s life. Marburg for instance, where Elisabeth died at the age of twenty-four. Currently there are three trails that together constitute the Elisabethpfad. Each of them ends at the Elisabehtkirche in Marburg, the site of her first grave. The trails start at either Frankfurt am Main, Eisenach or Köln. The trails are used as pilgrimage ways, “Weg der Jakobspilger” as they say in Germany. The ideal itinerary starting from Görlitz is over Eisenach and Marburg (Elisabethpfad and Jakobsweg share 80% if the trail) over Kóln to Aachen or Trier and then continuing the Via Lemovicencis in France. The trail offers a cross section of central Germany, an endless succession of orderly shaped hills, fields, forests, villages and towns.